-starting out in Junk Jack can be quite overwhelming at first, but you will pick it up in no time! ^Visit this if you have any more queries on how to start or where to go after you have read this! I have updated this guide for version 1.2.4 of Junk Jack which will sadly be the last update of it. -Starting out right is crucial in Junk Jack so make sure you know what you are doing! 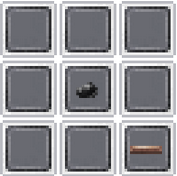 To craft you open up your inventory and there should be a 3x3 box on the right side of the inventory this is the crafting box. I would also suggest opening up your craft book and reading through that to see how to move and get a general view of the game. First off you will want to find the closest tree and punch it to death, depending on your controls (which you can change in the options menu) you can either repeatedly tap it or just hold it and it will come down. Run around and pick up its remains, you should now have some wood, leaves and possibly an apple or two. 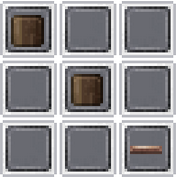 You will now need to make some WOODEN PLANKS, which are the basis for many crafts. 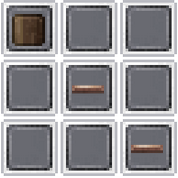 Wood can be anywhere in crafting slot. I will refer to wooden planks as just planks from now on. Next on the list of things to do, you may want to make yourself a wonderful PICKAXE to aid you on your journey. 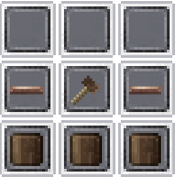 When you get stone you can replace the wood with stone to upgrade your trusty pick. 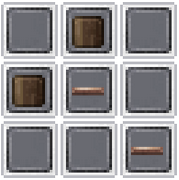 You can replace the wood with stone in the crafting recipe below. By now, your main goal should be to get coal! You need as much as you can get before nightfalls and you are thrown head first into total darkness. 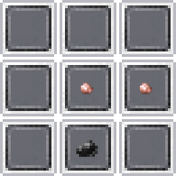 Coal can spawn in a numerous amount of blocks, the most common of which are dirt and stone. It is quite a common ore near the surface but you need to make sure you have it. After getting some coal you NEED to make TORCHES which will be the one thing that saves your life. When night falls terrifying monsters come out, and unless you are properly defended, you will die. Dying is quite annoying if you moved away from your spawn locations so I would suggest arming yourself with some kind of defensive weapon. The simplest weapon to make is a SWORD so make sure you have one or two with you! Chop some more wood down as you will need a lot! You now know how to craft the main tools. When digging you will occasionally find papers, these are called craft-notes. 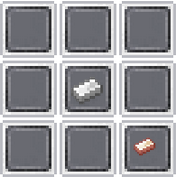 They contain recipes used to craft items. You don't need the recipe to craft the item, you just need to know how to craft, which is where these come in. To put a craft-note in your craft-book, open your inventory then touch and hold on the craft-note for a second or two. You can also buy a completed craftbook and support the developers, which will be incredibly useful if you wanted to know some quite advanced crafts. Your first house shouldnt be too fancy just out of wood or random blocks and will be designed to last you your first night and protect you from the horrors which emerge at night. 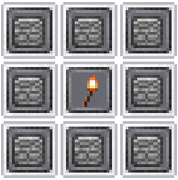 You can spend you first night underground which will help as you will get both materials and not have to deal with mobs, but make sure you bring enough torches! You may also find little crates underground which are the same size as blocks. 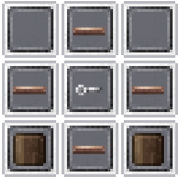 You should break every crate you come across as these are incredibly useful for craft-notes, planks and nails, which we will cover later. -So you are now feeling pretty confident right? You can kill a few slimes and skulls but you haven't even scratched the surface yet. Workbenches are used for nearly every craft in this game, be it furniture or crafting more addons. You need to have one before you can craft the other addons. To craft a work bench, you will first need to make a WOODEN HAMMER, this is another kind of tool which we haven't covered yet as you would not really need one up until now. They are used for destroying various blocks such as furniture, and are also needed for opening rare chests underground. You can replace the wood with stone to make a better hammer, but you need a wooden one to craft a workbench. After making the hammer you can make the workbench like this. To use a work bench you just have to stand near it and either open your crafting grid or tap the workbench, when you do so a little box will appear next to your 3x3 crafting grid, in the shape of a hammer. This means you can craft recipes which require the use of a workbench. Craft-notes with this little box mean they need a workbench to be crafted. You may have noticed by now, your inventory is getting a bit full and you need a place to store all your junk. This is where chests come in. 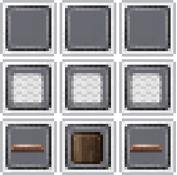 The most basic of all chests is a wooden chest which can store 12 items. To craft them you need nails, you will hopefully have a few from crates which you have destroyed while mining. If you do not you will have to wait a bit to craft a chest. You will probably want to place it down next to your workbench so you can stand in one place and have access to a number of addons. After killing a few Mr. Sheepies, you will get some raw wool which look like little balls. These have no real use like this so will need to be processed into yarn and then into cloth blocks. To make yarn from raw wool you will need to make a spinning wheel, which requires nails so make sure you have some! 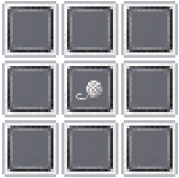 To make yarn put raw wool in your crafting grid, while standing near the spinning wheel. You will then need a loom to finally craft the yarn into cloth. To make a bed, grab that beautiful cloth you just made and head over to your crafting bench. Place the bed down then tap it, and whazam! You have now moved your spawn point, so if you do die while adventuring you can wake up safely in the comfort of your own home! You can also sleep in your bed to skip the night! To do so stand on in the same block your bed is on and click the bed. This is very useful for avoiding dealing with any kind of mob. Sleeping will also fully heal you. At this point, you either have a really drafty house, with gaping holes in the side, or have sealed yourself in. Neither of which is very healthy, so you will probably wish to craft yourself a door. -so you are all decked out with your stone tools, but there must be more to life then stone right?! While you were busy mining away underground, you may have noticed some shiny little ores in various blocks. These are either a metal ore, salt crystals, sulfur crystals or gems. The most common of which, are metal ores. These can be smelted down using your anvil to upgrade your tools! 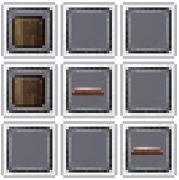 Here is a nice little table showing the strength and rarity of tools and ores. A good tip is not to make any kind of iron tool, as iron ingots are very useful in crafting so it would not be wise wasting any on tools. Silver is easy to find if you get down far enough! When you break a block with a metal ore in it, metal ore lumps will fall out. These need to be smelted into ingots to be of any use to you. Run over to your forge with some metal lumps and coal. 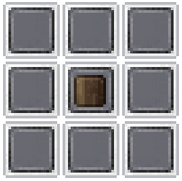 Replace the orange coloured ore (copper) with what ever you have! 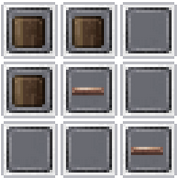 You will need some iron ingots to start of crafting any kind of metal tool, so either go back to mining if you don't have any, or continue reading if you do. 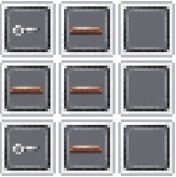 Now you can craft any kind of tool you need with the ingots you have to improve your mining speed or damage you can do to mobs. -I will share with you some more useful knowledge and useful crafts to know! A widget is a good thing to know how to craft, which if you do not have the recipe you will probably be confused by what it is. 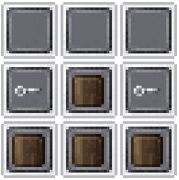 They are used in a number of crafting recipes from metal chests (with more space) to reinforced doors. 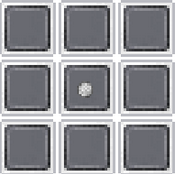 You need a iron ingot and a copper ingot to make this. Nails are also useful to craft if you ever run out of the ones you find. 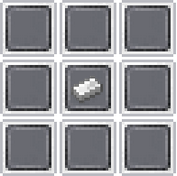 This craft gives you 9 nails for every iron ingot. Nails are used in almost every craft so make sure you have a plentiful supply. 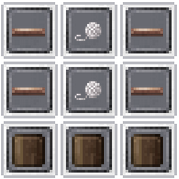 Bars are used in many crafts, from furniture to cooking addons so here is how to make em! 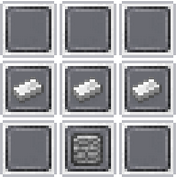 You get 3 bars for every 2 ingots you use. Here is some free tips which will help you. Underground you will find many containers which when broken will drop a ton of items, blocks and even tools! When broken they will give you glass shards, but also a spider or two may pop out so be aware of them before you smash them while next to them. 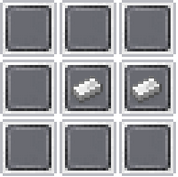 When broken these will drop various ingots, tools and crafting supplies! The loot you get from them depends on the style, but you can get crafting supplies, seeds, bandages and pills from them. They are the main source of nails for most people. DUNGEON CHESTS can also be found underground, here is an example of a gold one. These come in varying strength and will need a hammer to break. Depending on which kind of hammer they need will decided what kind of loot is in the chest, eg a diamond dungeon chest contains the best kind of chest loot. Different kinds of dungeon chests require different kinds of metal hammers to break. BIOME CHESTS can be found in their particular biome. They look like this but depending on what biome they are in depends on what they look like. The chests have varying strength with a particular kind of hammer or better needed to break them. The chests contain items related to their biome. EG Hell chest can contain hell stone. -I have taught you the basics of this game, however there is so much more for you to craft and make! While you were adventuring and journeying around your world, you will have picked up a few seeds and saplings. These are used in the art of farming. You may have noticed many animals wondering around your world, but did you know you can breed them and keep them as pets?! It really is quite awesome. There are so many different foods you can cook to fill Jack's stomach and also heal him. So you have some awesome tools and weapons, but did you know you can actually improve them with gems you find when mining? You can find even more guides on everything here! Feel free to send me a linkto your Junk jack guides so I can add them in this topic! Thank you so much for reading this all the way through, I hope I have set you off on your Junk Jack journey and I hope you have as much fun as I have had with this wonderful game. Have fun in the game!!! Last edited by TwelveFoot on Tue Jun 18, 2013 2:53 am, edited 39 times in total. This guide is so helpful! Thank you! I just downloaded the game an hour ago and I was getting so frustrated with the game... I was really disappointed with the lack of in-game instructions/help. I really shouldn't have to hop online to get help like this. Thanks for the link here do I have to find the note first before I am able to craft what ever items I need. BasedGod wrote: Thanks for the link here do I have to find the note first before I am able to craft what ever items I need. Thank you! How do you know so much about the game already? We're you a beta tester? I don't know how I would've figured out any of this stuff without your guide.I couldn't figure out how to craft anything aside from torches and wooden planks. I'm so glad you made this post, thanks again! Someone should make a Wiki for Junk Jack so its easily accessible with pictures and stuff, like minecraft's wiki. Actually, yes you can break boulders. I just needed an iron pick is all! I recieved the sheet for crafting the bed but it doesn't work and I have all the ingredients required. Please help! !